Can you guess what Arkham Horror The Card Game is all about? Here’s a hint: it’s not about trading in the Mediterranean. 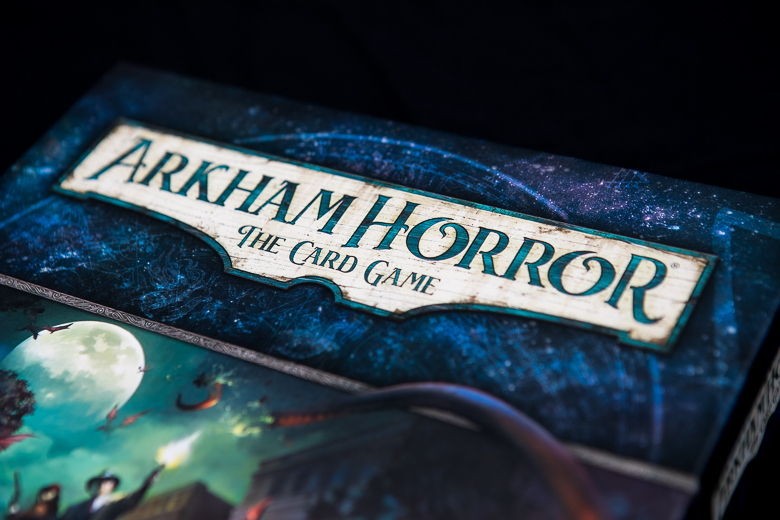 Fantasy Flight Games’ (FFG) Arkham series in general is about fear and madness. And in this regard, the latest entry doesn’t deviate from the formula. But there’s another trend to these games, of course. They can be difficult, scary and sometimes frustrating. So here’s the first shock of the review for you. Arkham Horror The Card Game feels different. Rather than bogging players down with a series of complicated rules, it focuses on narrative. As a player, shaping that narrative is in your hands. Yes, you can be killed in an instant, or be consumed by insanity. But losing a scenario doesn’t end the game. Rather, it provides you with a different ending, which you can carry into the next game scenario. But be warned: the implications of failure continue with you, and can crop up much later in the campaign. It’s scary, it’s fun and like any good horror story, it always leaves you wanting to turn the next page, despite your reservations about the horrendous creatures that are most likely waiting there for you. Arkham Horror The Card Game follows proudly in the twisted, murky footsteps of the Eldritch and Arkham Horror board games. It’s a cooperative card game that combines the movement and locations of a board game. The horror narrative is reminiscent of one of Ian Jackson and Steve Livingston’s Fighting Fantasy books. At the core of the game is the deckbuilding mechanic that provides players with an opportunity to customise their deck of cards. Only by personalising your approach can you hope to defeat the Eldritch creatures and cultists that inhabit the game. 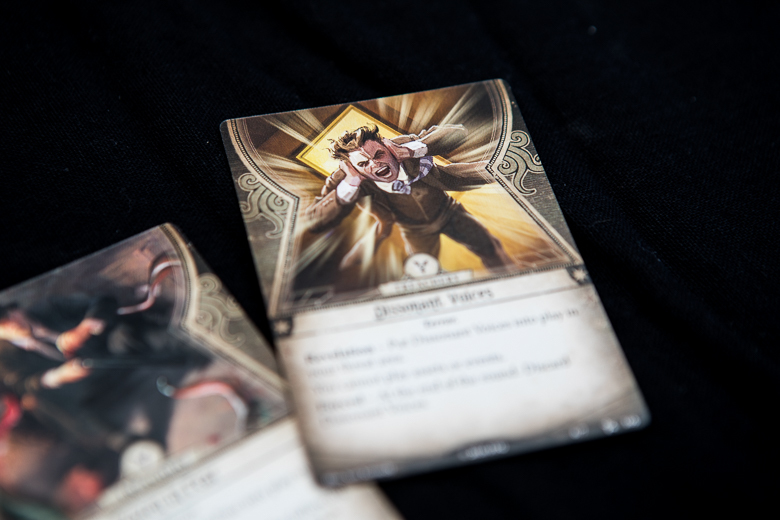 FFG’s Arkham games are set in the world of HP Lovecraft’s weird fiction. It’s a fictionalised version of the 1920s that deals with themes of forbidden knowledge, the inconsequential place of mankind within the universe and of, course, weird mutated creatures and gods who can turn you into a gibbering wreck before you can say the word ‘wibble’. The basis of Arkham Horror The Card Game is to explore this world, collect clues and defeat enemies. On face value, it sounds a bit like Cluedo. But instead of murdering Mr Black with the lead pipe in the conservatory, Colonel Mustard ritualistically sacrifices Mr Black to a goat demon in the basement with an ornate dagger. Lovecraft’s work has been well-mined over the years, which is understandable (his overbearing racism notwithstanding). His world is the perfect setting for a narrative game; something the story The Shadow over Innsmouth demonstrates beautifully. Minor spoiler alert for 80-year-old fiction incoming… don’t say we didn’t warn you. There’s a scene in the novella where the protagonist is holed up in his hotel room, when he hears the sound of sinister footsteps outside. The door handle rattles and protagonist needs to make a decision. Does he stay where he is? Does he move to one of the adjoining rooms? Or does he flee out the window? This scenario provides narrative tension, and the nameless protagonist gives the reader a sense of agency in the bleak town of Innsmouth. It’s similar to the agency a player has over their investigator in Arkham Horror The Card Game. Combine this with the feeling of unbearable tension, and the unrelenting foreboding atmosphere at the heart of Lovecraft’s work, and it’s clear why this work makes a perfect setting for a narrative adventure game. Arkham Horror The Card Game nails this feeling of inevitable doom and ruinous atmosphere within its mechanics and narrative. You always feel the odds are stacked against you… which they usually are. But that offers a real sense of accomplishment if you manage to survive with your body (and mind) intact. It’s fun, engaging and like Lovecraft’s best work, occasionally terrifying. Look. We here at Boards and Booze are fans of Eldritch Horror but it IS one of those games that can take a whole afternoon to play. It’s complex, and it takes a long time to set up. The great thing about Arkham Horror The Card Game is that it’s easy to set up, and quick to play. It sacrifices none of the difficulty or interesting mechanics of its predecessors in the process. 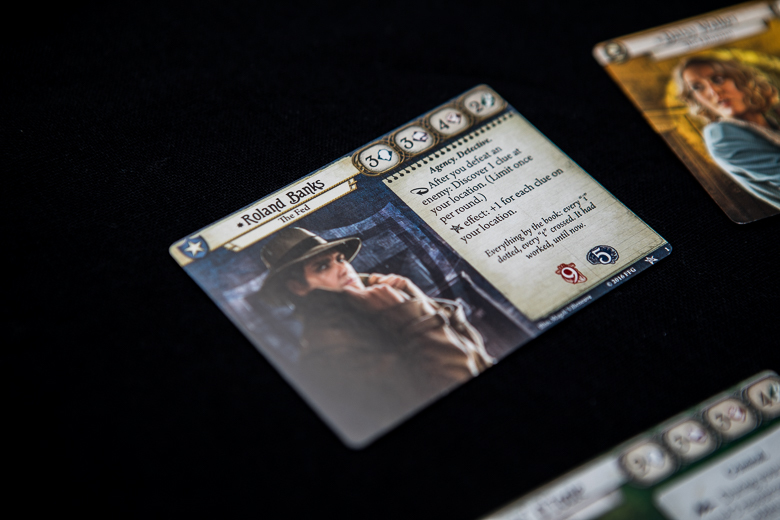 Each player takes the role of an investigator, of which (in the core set) there are five to choose from. These investigators come with their own skills, cards, abilities and weaknesses, and the variety is refreshing. For example, you can play the game as a former cop who hits first and asks questions later (why wouldn’t you?). Or you could be a feisty street urchin, whose biggest skill is the ability to run away and hide (which is actually an important part of the game). Each player has to set up their own deck of 30 or so cards. This deck is a combination of skills, events or assets that can help your team collect clues and defeat enemies as the game progresses. 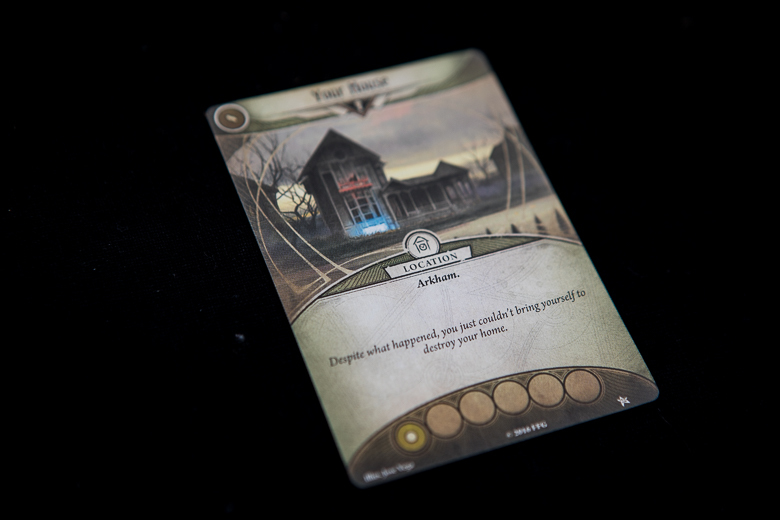 But this being an Arkham game, your deck also contains personalised, debilitating weaknesses that can cause your investigator to turn their focus away from the task at hand. The scenarios themselves are based on two small decks of cards: the Agenda deck and the Act deck. The Act deck sets out the story, and what the players need to do to succeed. The Agenda deck progressives the dark (usually tentacled) forces that are out there to defeat you. Although this is simple, it really does an excellent job of adding tension to the game. There’s a nervous thrill when you have to turn the cards on either deck over to see what’s going to happen next (spare underwear may be required). Each scenario has a number of locations, many of which will be familiar to Lovecraft fans. Players can (or sometimes cannot) move between them – so it does really feel like a board game. You’ll need to investigate these locations to find clues with which to progress the Act deck. Each turn, the players take three actions (such as searching, moving or, of course, fighting). Success in any of them is based on taking a check against one of the investigators stats. These can be modified by the cards in your (or those of your fellow players). So, if you want to hit the drooling dustman with your trusty baseball bat, Charlene, you’ll have to test your combat skill. If you want to ignore the axe wielding maniac coming at you in favour of reading an entry on the common weaknesses of said maniacs in your encyclopaedia, you’ll need to test your intellect. 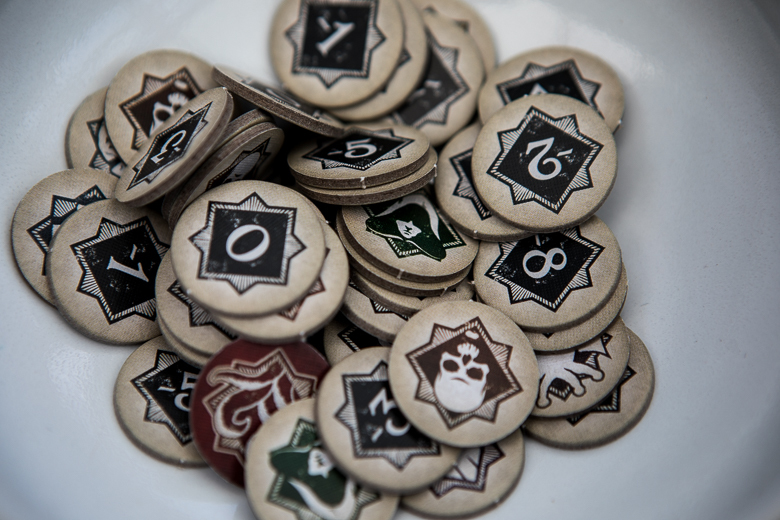 But here’s the proverbial kick in the balls: for every test you make, you have to take a Chaos token. These add a modifier to the result (similar to Gloomhaven’s modifier deck). This is an Arkham game though, so the odds of a bad result far outnumber those with positive modifiers. (What do you mean, minus eight?!) The Old Ones really don’t want to make things easy for you. There’s also an interesting mechanic, which adds variety in the campaign, in that three of the symbols’ effects will vary depending upon the scenario you’re playing. So, a skull is good… right? The narrative sticks to the tropes of the genre, but it’s well written, succinctly conveying atmospheric dread in descriptive text. The artwork is brilliant too. A lot of the fun is the excitement of seeing a new monster or asset for the first time. Furthermore, there’s good variety in the scenarios in the Core set. One scenario in particular had a nasty surprise in the agenda deck that really added to the helplessness of the situation. I playtested the game solo which works really well, but it’s cooperative gameplay that really adds an extra dimension. Players are encouraged to converse in character and work together to solve the mysteries. With the right group, it could cross the boundaries between a board game and a RPG. 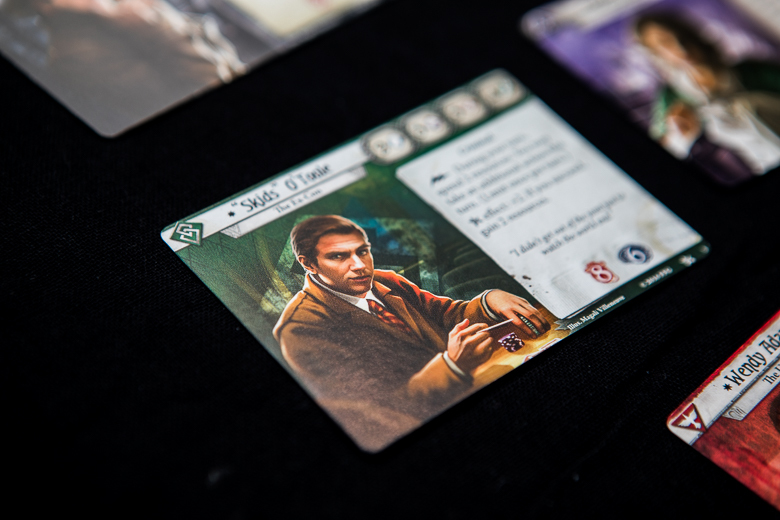 FFG describes Arkham Horror as one of its ‘living card games’: it’s basically a variant of collectable card game. Regular expansion and ‘Mythos packs’ releases are introducing new scenarios, skills and monsters – but they’re not randomised loot boxes. They’re fixed sets that allow players to grow and customise their decks to better battle the bleakness ahead. Playing with the core set alone is an option… but really, it feels like a taster. The ongoing storytelling plants a strong desire to keep on descending into this dark twisted world. But be warned, the game can get expensive – an expansion box and six mythos packs will set you back around £100 ($130) for a campaign. Has anyone in Arkham ever used baseball bats to actually play baseball? Here’s the rub, really. If you’re interested in a one-off game to play occasionally, this may not be the one for you. It’s the ongoing ‘legacy’ of the game that’s caused it to take off. If you look online, a whole community has grown up around it. There are podcasts, subreddits, apps and YouTube channels dedicated to Arkham Horror The Card Game. As someone who loves to delve into world building details, I can definitely understand its wider appeal. I have to admit I’m hooked. I’m already casting covetous glances over at the Dunwich Legacy expansion. Having glimpsed a world filled with pig-masked psychopaths and be-tendriled creatures, I’m intrigued to find out more.